A practical guide to the key tools for creating a lasting and loving relationship. Recognize relationship as an emotional healer; identify triggers, move through them, and come back into ease and aliveness. Discover how intimacy in relationship requires curiosity, wonder, and the ability to find the truth of one's experience deep in one's body. Discuss how to speak the "unarguable truth"; utilizing the eight step moving emotions process—moving from stuckness into emotional flow. Define three toxic habits within relationships and their antidotes—transforming our own behavior, as well as those around us through positive attention. Summarize how to move out of power struggles within relationships and into agreements which allow everyone to get everything they want. Discuss how to live within the relationship you really want moving between contractiona and expansiveness—welcoming appreciations, creativity, play, aliveness, as well as love for self and other. Utilize checklists, tools, and journaling exercises as a way to engage, reflect and explore relationship skills and self-growth. Julie Colwell's work has had a profound impact on my work as a family therapist. Her work has helped me and the families I work with to live and communicate without blame and move toward what we really want in life. This is a must read for all family therapist. Julia's book is easy to read, easy to follow, and has had a great impact on my relationship with my self AND on my relationships with a number of other people. The approach is to understand how your own emotions work first, and then get buy in from your friend, so you both learn how to have better lives and to deal with each other's ups and downs. I loved this book! I recommend it without reservation to anyone who wants to live with passion and creativity. 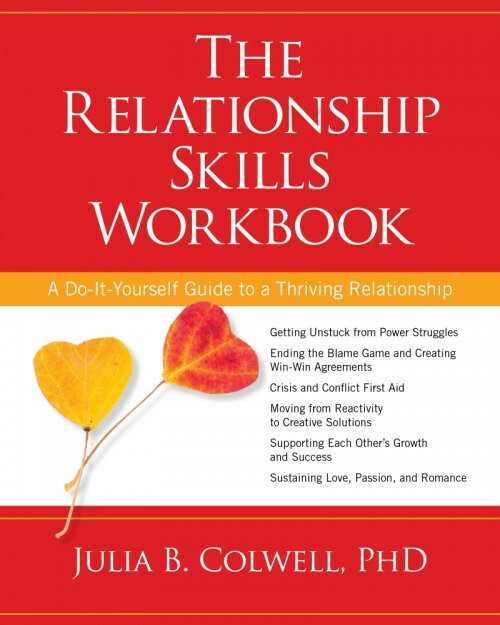 “Can you recommend a good book?” I am asked this question at least twice if not more weekly and thus I was delighted to review Dr. Julia Colwell’s latest book, The Relationship Skills Workbook. I have recommended her first book, The Relationship Ride, a number of times, thus I was hopeful that this next one would be a keeper.